You don't have to start your own home knitting business to make an income from your knitting. You can also work on a freelance basis, taking in projects for companies or individuals. This is a unique niche to get into, but it's a great way to bring in a little extra income. The first step to finding work is to establish yourself as someone who is an expert at knitting and a reliable freelancer. Rewrite your resume, focusing on the specific skills that will make you marketable. Do you have experience in the textile industry or in retail? Have you been a freelancer in other areas, such as writing or photography? Has your knitting received any awards? Ultimately, you want to highlight the qualities that will appeal to knitting businesses, such as the ability to produce quality work quickly, reliability, and professionalism. No matter how good you are a knitting, the jobs are not going to fall into your lap. Being proactive and devoting some time each day to looking for work will help keep you busy. Try these ideas. Upwork - Sometimes, individuals will post ads on this site asking for help with knitting. It's always worth a look. Flexjobs - Flexjobs includes postings for craft-related businesses, such as freelance knitting work for craft companies. Freelancer - Although the opportunities are not common, it's a good idea to keep an eye on listings on Freelancer, where companies sometimes require someone who can knit. Look at some of the most successful knitting businesses on Etsy. Do they have a long turn-around time on items? Is there a holiday rush coming up? They may need help but think they can't afford to hire a freelancer. Take a look at their items and decide how long it would take you to produce them. Then email the shop owner to see if she would be interested in your help. Keep in mind you'll need to price your services competitively, and you'll likely need to send a sample of your work. Independent pattern makers often sell their designs on Etsy, in knitting magazines, and at craft fairs. However, when someone creates a pattern, they need people to test it and provide feedback, and this is a perfect job for freelance knitters. You can knit samples from these new patterns, take careful notes about the process and any concerns you have with the instructions, and then mail the finished sample to the pattern creator. You can find jobs by directly contacting pattern creators and asking if they need someone to help with samples. Many farmer's markets have moved beyond veggies and fruit and now offer textiles. Local wool producers sometimes have stalls selling yarn or roving. It never hurts to stop by these stalls and ask if they'd like to hire someone to knit their yarn into marketable items like socks and mittens. They may not have the time or skill to do the knitting themselves, but they may be able to sell more of their products if they are transformed into something buyers really want. The worst they can do is say no. 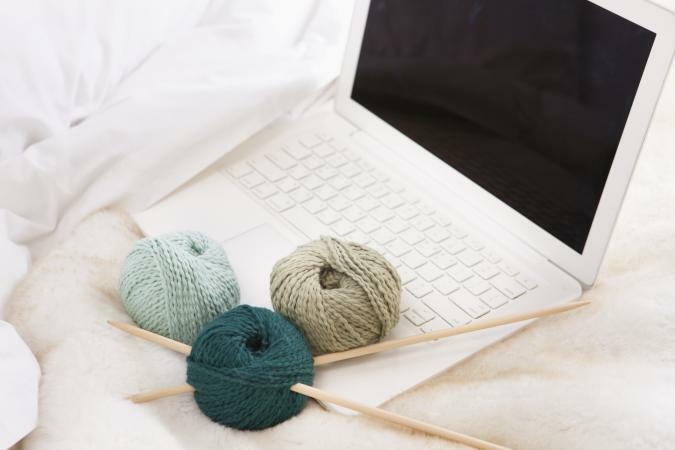 You can also market yourself online as a freelance knitter. Post your resume, samples of your work, and testimonials from past customers on your website. Consider starting a blog to help bring web traffic to your site. You can discuss knitting and small business topics and further add to your credibility as a reliable and knowledgeable freelancer. It's best to try as many avenues as you can to find great freelance work. That way, you can spend your time knitting for a number of clients and make a steady income using your talents.